The every-day afternoon tea table is familiar to everyone; there is not the slightest difference in its service whether in the tiny bandbox house of the newest bride, or in the drawing-room of Mrs. Worldly of Great Estates, except that in the little house the tray is brought in by a woman—often a picture in appearance and appointment—instead of a butler with one or two footmen in his wake. In either case a table is placed in front of the hostess. A tea-table is usually of the drop-leaf variety because it is more easily moved than a solid one. There are really no "correct" dimensions; any small table is suitable. It ought not to be so high that the hostess seems submerged behind it, nor so small as to be overhung by the tea tray and easily knocked over. It is usually between 24 and 26 inches wide and from 27 to 36 inches long, or it may be oval or oblong. 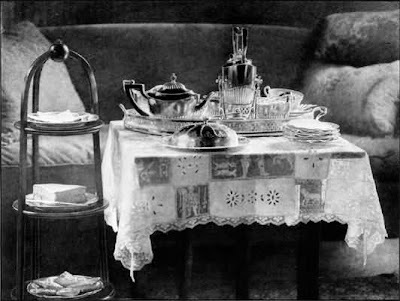 A double-decked table that has its second deck above the main table is not good because the tea tray perched on the upper deck is neither graceful nor convenient. In proper serving, not only of tea but of cold drinks of all sorts, even where a quantity of bottles, pitchers and glasses need space, everything should be brought on a tray and not trundled in on a tea-wagon! A cloth must always be first placed on the table, before putting down the tray. The tea cloth may be a yard, a yard and a half, or two yards square. It may barely cover the table, or it may hang half a yard over each edge. A yard and a quarter is the average size. A tea cloth can be colored, but the conventional one is of white linen, with little or much white needlework or lace, or both. On this is put a tray big enough to hold everything except the plates of food. The tray may be a massive silver one that requires a footman with strong arms to lift it, or it may be of Sheffield or merely of effectively lacquered tin. In any case, on it should be: a kettle which ought to be already boiling, with a spirit lamp under it, an empty tea-pot, a caddy of tea, a tea strainer and slop bowl, cream pitcher and sugar bowl, and, on a glass dish, lemon in slices. A pile of cups and saucers and a stack of little tea plates, all to match, with a napkin (about 12 inches square, hemstitched or edged to match the tea cloth) folded on each of the plates, like the filling of a layer cake, complete the paraphernalia. Each plate is lifted off with its own napkin. Then on the tea-table, back of the tray, or on the shelves of a separate "curate," a stand made of three small shelves, each just big enough for one good-sized plate, are always two, usually three, varieties of cake and hot breads. I love everything associated with afternoon tea, it is my very favourite meal (I think because it is unncessary and therefore something of a luxury!) But where do you find the lovely paintings with which you illustrate your exceptionally attractive blog? Yes, it's something special with afternoon tea - maybe because it can be anything from simple to fancy depending on your mood. Our daily tea at five is usually very simple but relaxing - tea, music and a book by the fire. In the summer we usually sit outside. The web is full of all kind of paintings and pictures - it does take time to find them but it is so interesting and I learn so much. I also have quite a few books about art.